T/O Marham 2023. Target Nuremburg, Germany. A/c was badly damaged by a night fighther over the target. Sgt Clay was mortally wounded, a/c returned savely to base. Wellington Mk III X3675 KO-D - 3 KIA, 1 POW, 1 Evd. Wellington Mk III X3647 KO-A - 4 KIA, 1 POW. W/C - Service No 44076 - DFC, DSO & CMM. 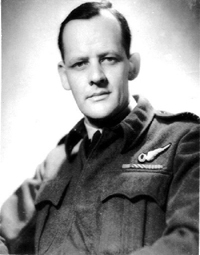 Only a month in charge of 635 squadron, Cousens was killed in action on 22nd April 1944, acting as the Master Bomber, the target was the marshalling yards at Laon, France. Clay Henry - W.Op./Air Gnr. Son of John and Mary Clay, of North Shields.